Rugs aren’t just a simple thing to cover your floor but are actually an important design element, especially in a living room. The specific material of the rug can influence the feel of the room creating a visual noise or bringing in some pattern and texture. A Flokati rug is a special kind of handmade shag wool rug. 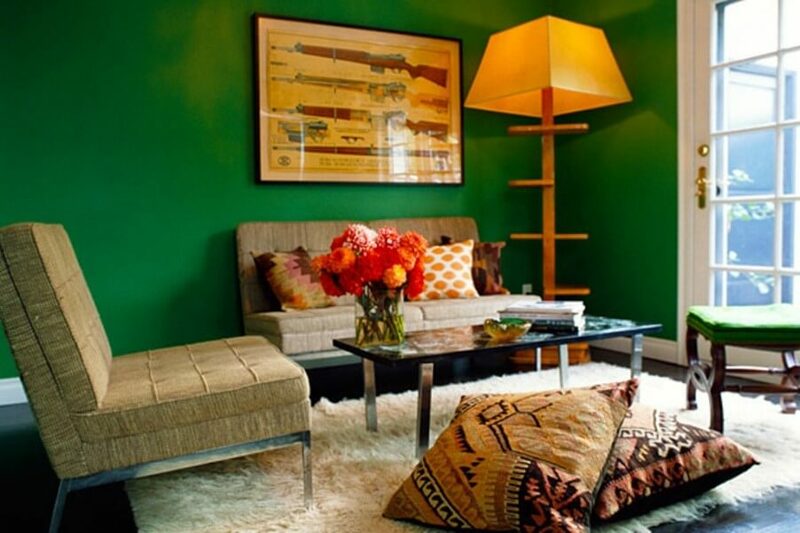 It’s shag nature is perfect for creating a bold and soft texture on the living room. It can also help enhance an elegant or sophisticated look as well if that’s the kind of design you’re going for. Adding a Flokati rug is one of the easiest and quickest ways to enhance how your living room looks, creating some visual “buzz”. In this post we’ve rounded up a collection of examples that are a feast for the eyes! Check them out below. 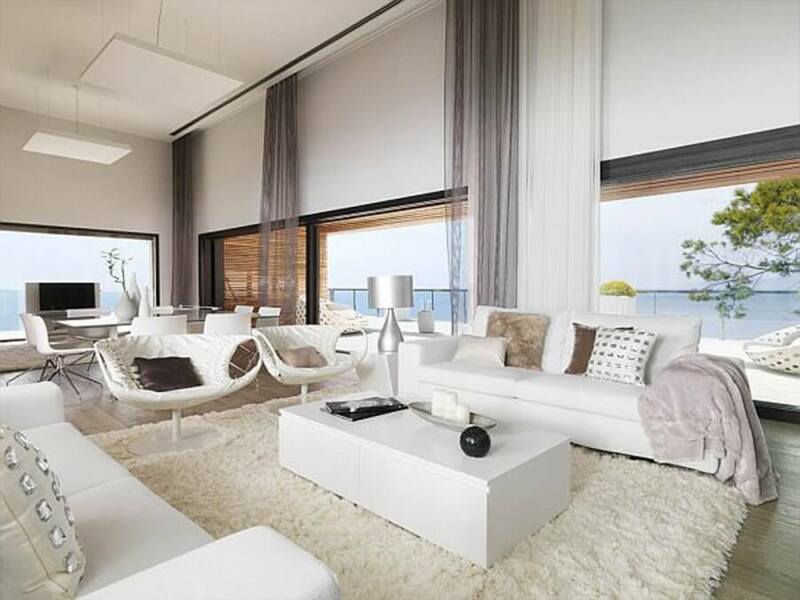 This living room looks just like heaven. The super soft and tender white Flokati rug is the main charmer in this sweet, pastel colored living room. 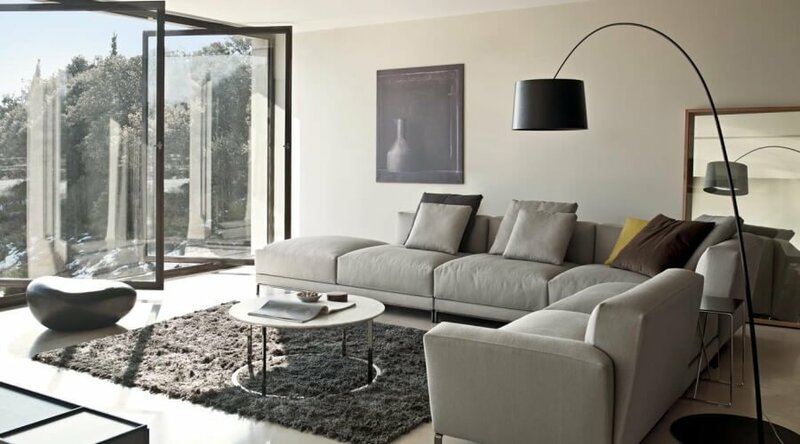 The center of the room is definted by that rug and it’s extremely soft texture which elevates the serene and charming vibe in this super chic living room. The wide Flokati rug superbly adapts to the elegance of sophisticated nature of this beautiful living room. It also strikes against the gray walls and opens up the room bringing in a clean, sharp and refreshing ambiance. 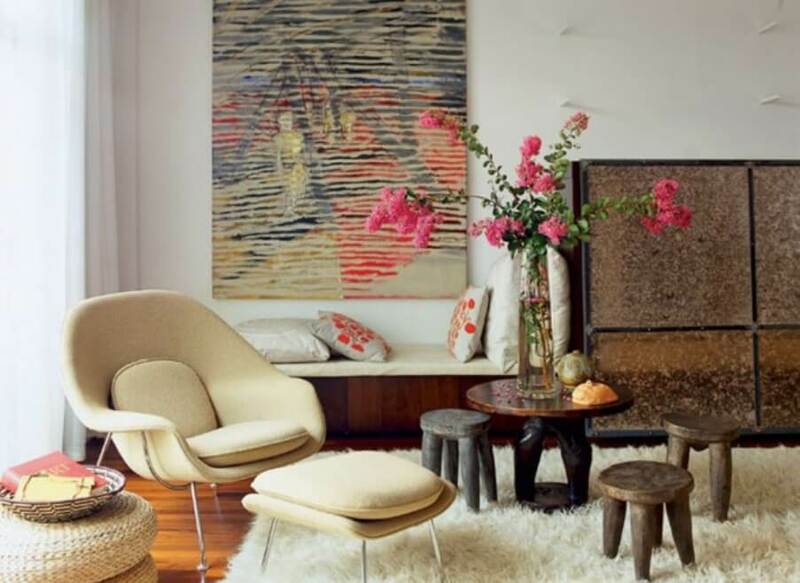 We love the warm and breezy statement this creamy shag rug makes in this class living room. It adds some substance and texture while helping to soothe the dark colours making everything more soft and comfortable. The shabby chic settings of this living room is perfectly decorated with the white Flokati rug. It makes a beautiful and elegant statement here and cuts through the elegance bringing in some bright and cheery energy. The white shag rug here totally opens up the dark green living room creating a perfect balance in this modern bohemian chic living room. It plays a subtle yet powerful role here and the room just wouldn’t be the same without it. A Flokati rug also works well in a big wide open living room like this. 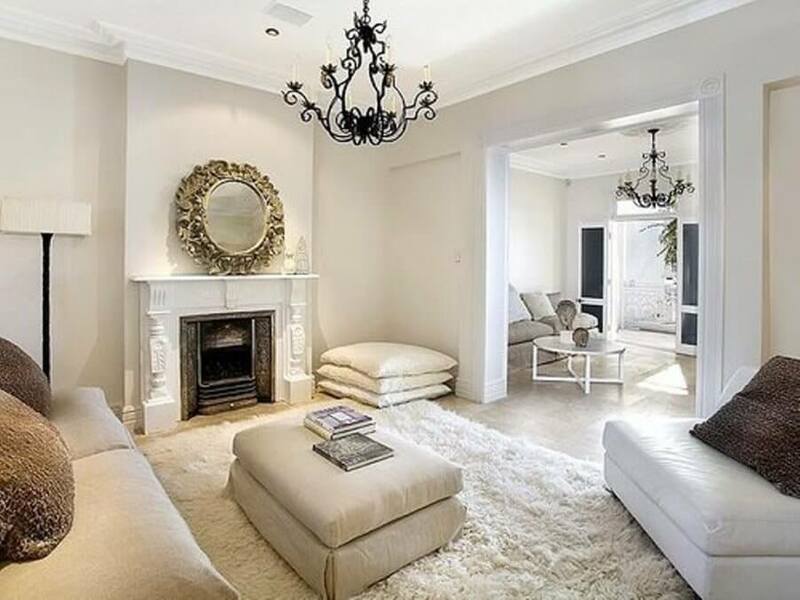 The room is already nice and bright and open but the rug enhances everything, bringing in a soft refreshing ambiance. Everything here is nice and breezy, laid back and fantastic. A Flokati rug doesn’t always have to be white. 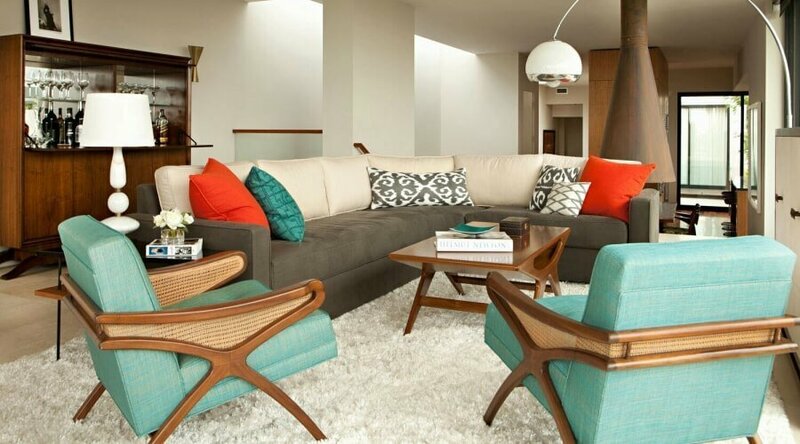 Here we have a copper colored one that worked its way into this super modern living room. 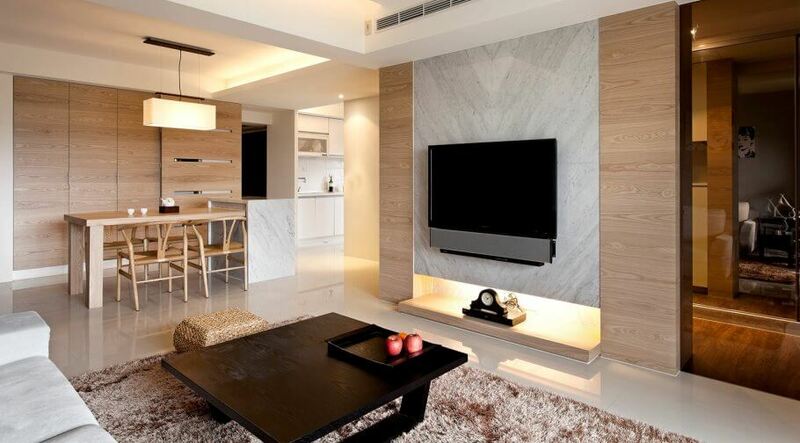 It brings a sophisticated and soft ambiance to this beautiful contemporary space. This room is fantastic with pops of different colors, a mid-century setting and of course the big clean white Flokati rug. The shag texture soothes the vivid colors and defines the center of the room brightening everything up and making it feel more comfortable. 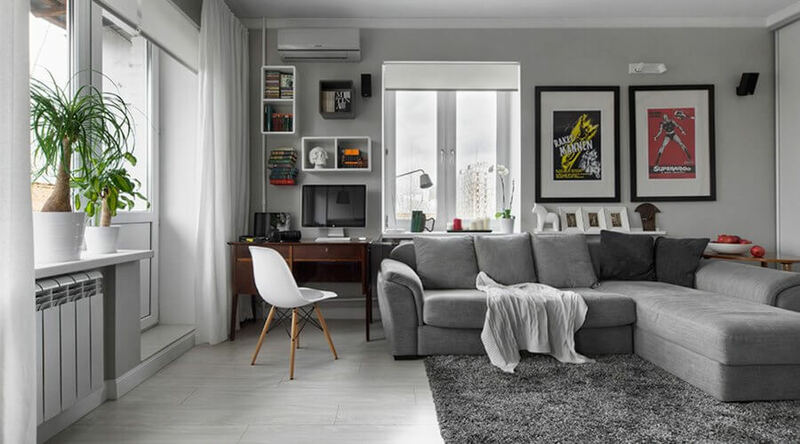 We love the harmony and soothing energy in this chic and charming living room. 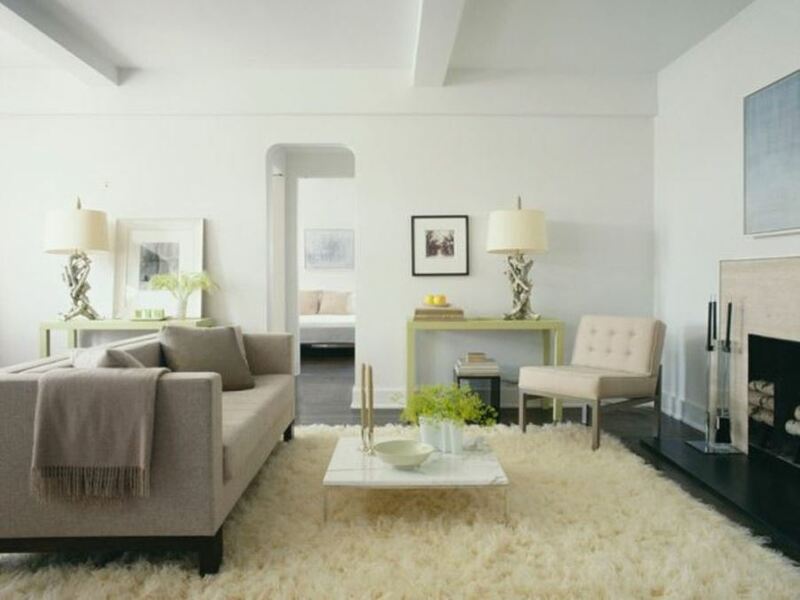 The white shag rug sets a super soft foundation for everything and brightens up the space. The white noise and vibrant texture you can feel here is 100% due to the subtle yet powerful dominance of the white Flokati rug. Here’s another fantastic example of a non-white colored rug. The coal grey color here brings an opulent and vibrant noise to this contemporary interior and creates a dynamic visual appearance. The dark coal gray Flokati rug fits in perfectly with the gray color scheme of this high-end contemporary living room. It sets a bold, solid and vibrant focal point while brining some softness and texture to the otherwise flat looking living room.